SCVHistory.com HB1825 | Piru | Harry Lechler's Museum: Wooden Nickel Advertising Piece, 1969-2000. 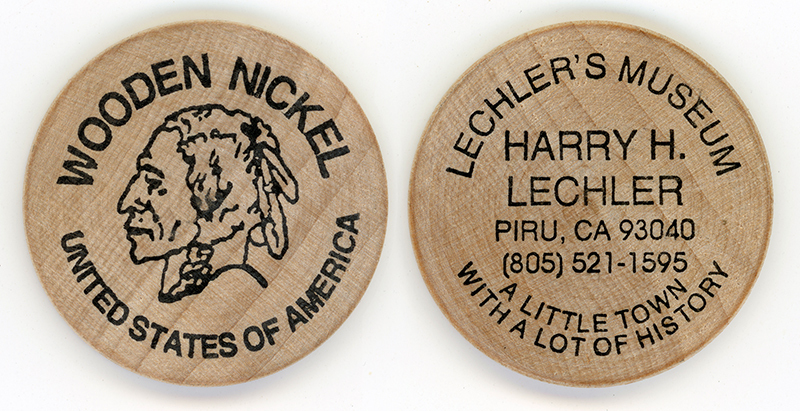 "Wooden nickel" advertising piece for Harry Lechler's private museum on Main Street in Piru, built in 1969 and shuttered in 2000. Promotional use only (not a good-for token). 1½-inch diameter. Front-to-back alignment is random, based on observation of multiple examples. Front reads: "Wooden Nickel / United States of America" and shows a Buffalo nickel-style bust of a male Indian. Lechler's Museum / Harry H. Lechler / Piru, CA 93040 / (805) 521-1595 / A Little Town With a Lot of History. 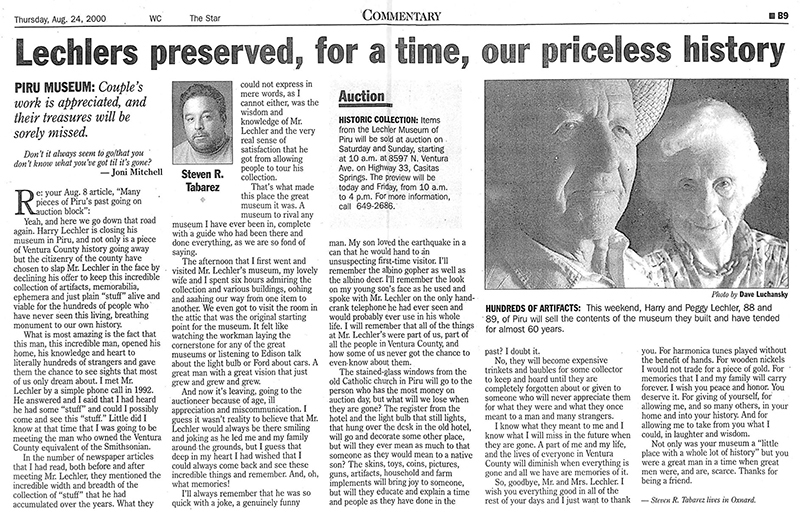 Examples donated by Oxnard resident Steven R. Tabarez, who wrote the following commentary when the contents of Lechler's Museum went on the auction block in August 2000. Re: your Aug. 8 article, "Many pieces of Piru's past going on auction block:"
Don't it always seem to go / that you don't know what you've got til it's gone? Yeah, and here we go down that road again. Harry Lechler is closing his museum in Piru, and not only is a piece of Ventura County history going away but the citizenry of the county have chosen to slap Mr. Lechler in the face by declining his offer to keep this incredible collection of artifacts, memorabilia, ephemera and just plain "stuff" alive and viable for the hundreds of people who have never seen this living, breathing monument to our own history. What is most amazing is the fact that this man, this incredible man, opened his home, his knowledge and heart to literally hundreds of strangers and gave them the chance to see sights that most of us only dream about. I met Mr. Lechler by a simple phone call in 1992. He answered, and I said that I had heard he had some "stuff" and could I possibly come and see this "stuff?" Little did I know at that time that I was going to be meeting the man who owned the Ventura County equivalent of the Smithsonian. In the number of newspaper articles that I had read, both before and after meeting Mr. Lechler, they mentioned the incredible width and breadth of the collection of "stuff" that he had accumulated over the years. What they could not express in mere words, as I cannot either, was the wisdom and knowledge of Mr. Lechler and the very real sense of satisfaction that he got from allowing people to tour his collection. That's what made this place the great museum it was. A museum to rival any museum I have ever been in, complete with a guide who had been there and done everything, as we are so fond of saying. The afternoon that I first went and visited Mr. Lechler's museum, my lovely wife and I spent six hours admiring the collection and various buildings, oohing and aaahing our way from one item to another. We even got to visit the room in the attic that was the original starting point for the museum. It felt like watching the workman laying the cornerstone for any of the great museums or listening to Edison talk about the light bulb or Ford about cars. A great man with a great vision that just grew and grew and grew. And now it's leaving, going to the auctioneer because of age, ill appreciation and miscommunication. I guess it wasn't reality to believe that Mr. Lechler would always be there smiling and joking as he led me and my family around the grounds, but I guess that deep in my heart I had wished that I could always come back and see these incredible things and remember. And, oh, what memories! I'll always remember that he was so quick with a joke, a genuinely funny man. My son loved the earthquake in a can that he would hand to an unsuspecting first-time visitor. I'll remember the albino gopher as well as the albino deer. I'll remember the look on my young son's face as he used and spoke with Mr. Lechler on the only hand-crank telephone he had ever seen and would probably ever use in his whole life. I will remember that all of the things at Mr. Lechler's were part of us, part of all the people in Ventura County, and how some of us never got the chance to even know about them. The stained-glass windows from the old Catholic church in Piru will go to the person who has the most money on auction day, but what will we lose when they are gone? The register from the hotel and the light bulb that still lights, that hung over the desk in the old hotel, will go and decorate some other place, but will they ever mean as much to that someone as they would mean to a native son? The skins, toys, coins, pictures, guns, artifacts, household and farm implements will bring joy to someone, but will they educate and explain a time and people as they have done in the past? I doubt it. No, they will become expensive trinkets and baubles for some collector to keep and hoard until they are completely forgotten about or given to someone who will never appreciate them for what they were and what they once meant to a man and many strangers. I know what they meant to me and I know what I will miss in the future when they are gone. A part of me and my life, and the lives of everyone in Ventura County, will diminish when everything is gone and all we have are memories of it. So, goodbye, Mr. and Mrs. Lechler. I wish you everything good in all of the rest of your days, and I just want to thank you. For harmonica tunes played without the benefit of hands. For wooden nickels I would not trade for a piece of gold. For memories that I and my family will carry forever. I wish you peace and honor. You deserve it. For giving of yourself, for allowing me, and so many others, in your home and into your history. And for allowing me to take from you what I could, in laughter and wisdom. Not only was your museum a "little place with a whole lot of history," but you were a great man in a time when great men were, and are, scarce. Thanks for being a friend. Steven R. Tabarez lives in Oxnard. HB1825: 9600 dpi jpeg from original wooden nickel donated 2018 by Steven R. Tabarez.